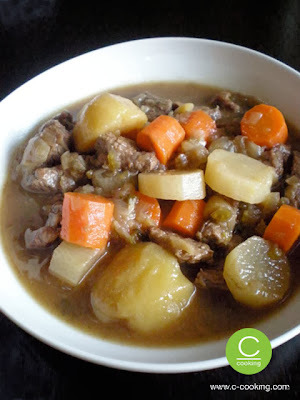 After a cold day of being outside in the snow, there is nothing like a good stew. It takes a while on the stove top to break down the meat, so it’s a great dish to prepare the meat in advance. When reheating, add the vegetables an hour or so before serving it up. Add cabbage, eggplant, sweet potatoes, tinned beans, cauliflower and/or more carrots to jazz it up a bit, or to revive any leftover stew. In a shallow bowl, season the meat on all sides, sprinkling with salt. Toss with flour to coat the meat evenly with a thin layer. Coat the bottom of a large dutch oven (casserole) with a bit of oil. On medium-high heat, sauté the garlic, onion, and celery for 5 minutes, until the onion is translucent. Scoop out and set aside in a large bowl. Add more oil, and on high heat, fry the meat so it's browned on all sides (about 1-2 minutes per side). You may have to do this in two batches. Add more oil in between batches, if necessary. When meat is browned, scoop out and set aside, on top of the cooked veggies. Pour a small amount of water into the pot so it will bubble up quickly. Use this to help scrape up any bits stuck to the pan (de-glaze). Put the cooked garlic-onion-celery mixture and the meat back into the pot. Add the potato chunks and fresh herbs. These potatoes will break down as they are cooking, and help thicken the stew. Fill pot with just enough water to cover all ingredients. Bring to a boil. Skim off any frothy bubbles that rise to the surface for the first 15 minutes. Add the bouillon cube. Turn heat down and cover to simmer (make sure that it is gently bubbling) for an hour or two. Stir occasionally. I like to use kitchen scissors to cut the meat into smaller shreds when I am stirring, so that the meat absorbs more of the soup flavors, but this is not necessary. Season with salt, to taste. You can take out the stems of the herbs at this point, but can also leave them in. After the first simmering time, turn heat back up to high and add the daikon, carrots and new potatoes. Bring to a boil. Again, skim any froth that rises to the surface. Turn heat to a low simmer, cover and cook for a further hour. Serve as is, or with a warm, crusty loaf of bread or steamed rice.